In 1982, as the Lancia Stratos slipped away, the Lancia 037 rolled out for the first time. The Fiat-Lancia group needed a new rally car to follow on from the illustrious Flavia, Fulvia HF, Stratos and 131 Abarth models. The new car was called the Lancia-Abarth Rally, project code 037, and was developed from 1980 onwards by a small team led by Sergio Limone. The prototype was based on the central cell of the Lancia Monte Carlo, with tubular steel structures at the front and rear. The 4-cylinder engine, transversely mounted on the production car, was installed lengthwise. While maximum power of around 300 bhp at 8000 rpm was planned for the 2-litre engine in competition form, the production version and the car we present here still developed more than 100 bhp per litre, with an output of 205 bhp at 7500 rpm. The gearbox prescribed was a sturdy ZF unit with five speeds. The bodywork was designed and produced in polyester and fibreglass resin by Pininfarina. Delivered new in Paris, and in the hands of its fourth owner for almost seven years, the car has been regularly maintained by a specialist in south-west France. A competitor in several historic rallies such as the Coupe des Alpes and the Trans-Pyrenean rally, the car still demonstrates exceptional performance and handling. As an amusing side note, its previous owner, a lady who was anxious to drive her car in greater comfort, had bucket seats trimmed in black cloth fitted, to give her better support during her ‘sporting’ outings. 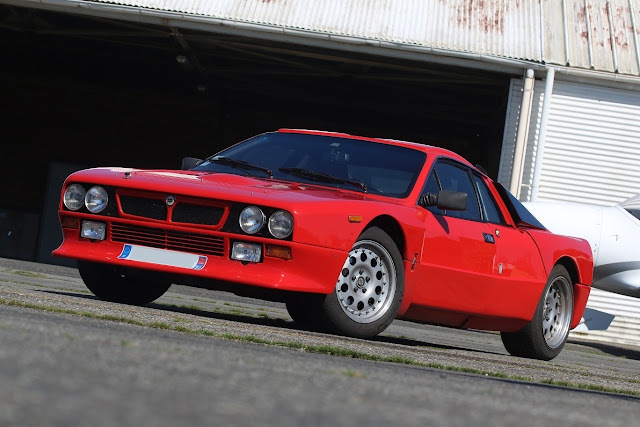 It has to be said that this rare Lancia, with its high performance and exemplary handling, is the ideal toy to enjoy on many rallies. 20 competition models were produced and just 200 cars built to meet the homologation requirements for this pure rally-going special. The 037 Rally is one of those iconic models which remain affordable and, above all, easy to use. There can be no doubt that the car we are offering represents an exceptional opportunity to enjoy this legend. Contact Aguttes for more details.